Companies exhibiting a prominent presence in the global zinc dialkyldithiophosphate (ZDDP) additives market for zinc dialkyldithiophosphate (ZDDP) additives include Prasol Chemicals Pvt. Ltd., Rislone CamGuard, AMSOIL, Mukund Anderson Inc., ZPlus, LLC, Infineum International Limited, Afton Chemical Corporation, and Chevron Oronite Company LLC, notes Transparency Market Research (TMR). A number of leader players are increasingly focusing on innovative product launches and spending substantial amounts in research and development activities, in a move to stay to ahead of their competitors. Several top players are harping on aggressive marketing as a key strategy, in a move to consolidate their positions in the ZDDP market. A growing number of players are also offering products that can meet a variety of performance needs, which helps them gain a better foothold in the global market. The ease of procurement of various manufacturing technologies is attracting new players in the market. The global zinc dialkyldithiophosphate market is projected to rise at a CAGR of 1.6% from 2017 to 2025. The market was worth US$2,717.82 million in 2017 and is estimated to touch a valuation of US$3,085.79 million by the end of the forecast period. The key product types of ZDDP additives comprise primary alkyl and secondary alkyl. Of the two, the secondary alkyl formed the leading segment in 2016 accounting for the major revenue share. The widespread uptake of the segment can be attributed to a highly attractive profile of ZDDP additives, characterized by marked hydraulic stability and significant antiwear protection abilities. Geographically, Asia Pacific is set to be the most attractive market presenting abundant lucrative opportunities for players. The regional market, led by China, held the major share in 2016 and is anticipated to be worth US$1,189.68 million by the end of the forecast period. The growth will be fueled by the substantially rising automobiles industry and the rapid strides taken by the manufacturing sector in various emerging economies. The striking strides being experienced by the automobile and automotive industry in a number of emerging economies, notably in Asia Pacific, are likely to create abundant opportunities for market players over the assessment period. The substantial use of additives in a range of industrial, professional and consumer end-use applications is aiding in the rapid expansion of the market. The widespread use in in lubricants and greases is attributed to several attractive functional properties. However, of late, several countries are facing worrying concerns over the presence of phosphorous content in ZDDP. This leads to ZDDP adversely affecting vehicular exhaust system. In particular, phosphorous also makes a dent in the efficiency of engines, due to which several nations have put safeguards on the permissible level. Furthermore, intensive efforts by industry players and ceaseless R&D activities to find alternatives to ZDDP may act as bottlenecks to the growth of the market. Nevertheless, the remarkable high thermal and hydrolytic stability makes it ideal for high-pressure applications such as in metalworking fluids. 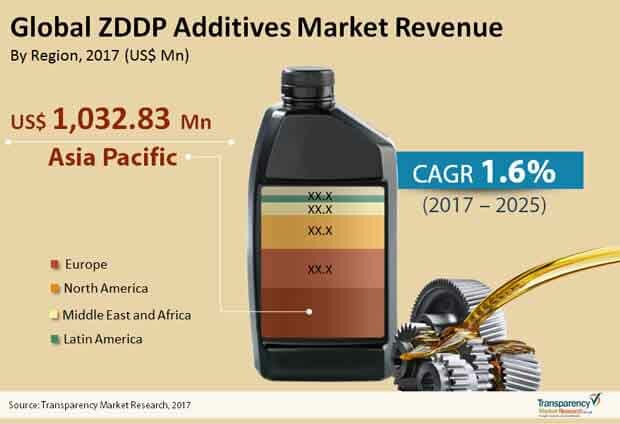 The substantial use of ZDDP additives in making industrial lubricants and engine oils for automobiles is boosting market. Unfavorable regulations in several nations limiting the use of ZDDP due to phosphorous content may hinder the growth of the market to an extent.